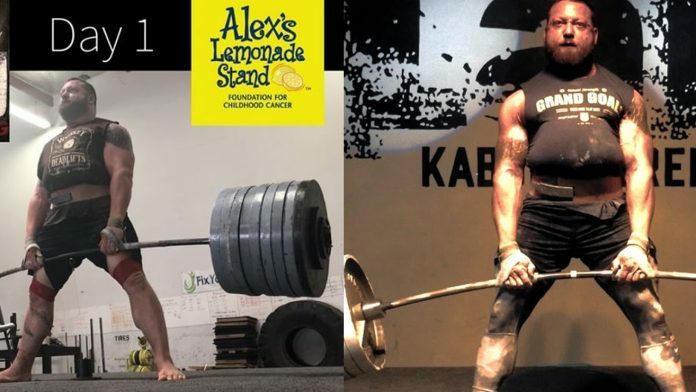 Powerlifter Chris Duffin has taken up the challenge of deadlifting 880lb (400kg) every day for a month to raise money for Alex Lemonade Stand, a cancer research foundation. Duffin is no stranger to incredible feats of strength. He also holds the world record for the heaviest raw squat in the 220lb class, with a leg-shattering 859lbs. On top of that he smashed the Guinness World Record for deadlifting the most weight in a minute. He clocked up a huge 17,010lbs after fitting in 42 reps at 405lbs. Now he’s set his sights on raising money for Alex’s Lemonade Stand, a cancer research charity that specifically funds research into children’s cancer. The charity was started by a four-year-old girl called Alex, who raised over a million dollars before she passed away from neuroblastoma at just eight years of age. Duffin announced the challenge on his Instagram account and said their whole team was heartbroken when they heard Alex’s story from her mom Liz. He decided to create a charity event, as the fourth pillar of his gym, Kabuki Strength, is charity. They hope to not only raise money, but also to raise awareness for the specific cause and Alex’s Lemonade Stand. Duffin is using his social media platform and status as a pro-lifter to document the lifts and reach out to people to encourage them to donate to their cause at 880everyday.com. This isn’t the first time Duffin has used his social media and super-human strength powers for good. Earlier in 2018, he raised money for the Special Olympics by squatting 800lbs every day for 30 days. The event raised $6,500 for the cause, an impressive performance he hopes to repeat for Alex’s Lemonade Stand.